‘겨우살이’ 이민희는 울산에 살면서 일러스트를 그리는 다재다능한 아티스트다. 연필 스케치도 하면서 그림을 그리는데 이민희는 특히 점묘화를 그릴 때 더 빛난다. 점과 점으로, 중세 시대를 배경으로 한 작품들을 그리는데, 모두가 아는 친숙한 역사들을 멋지게 표현한다. Minhee ‘Mistletoe’ Lee is a multi-talented artist living and illustrating in Ulsan. Equally adept at painting as he is at pencil sketching, Lee truly shines in his use of stippling. Dot by dot, he renders scenes from a medieval world as fantastically rich as the all-too-familiar histories they echo. 나는 25살이고 현재는 내 그림에 집중하기 위해 잠깐 공부를 쉬고 있다. 최근에는 그림이나 점묘화를 그리는 것으로 하루 일과를 보내고 있다. 내년에는 울산대학교에서 학위를 끝내고 예술 전공으로 대학원을 다니고 싶다. 왜 이름이 ‘겨우살이’인건 얘기해 주지 않나? 아, 그 이름은 군복무를 하는 동안에 정한 거다. 겨울에 다른 식물들은 마르고 죽는데 겨우살이는 거친 어느 곳에서도 자란다는 것을 알게 되었다. 그래서 인생도 그렇게 될 수 있는 가에 대해 생각했다. 거칠고 험난하지만 우린 어떻게든 앞으로 나아갈 길을 여전히 찾고 있듯이. 그림을 안 그릴 땐 주로 무엇을 하는가? 휴식을 갖기 위해서 판타지, 공상과학 만화책을 읽거나 ‘Company of Heroes’ 와 같은 전략게임을 한다. 또 ‘알라트리스테’나 ‘쉰들러 리스트’같은 역사 영화들도 즐겨본다. I’m 25-years-old and, at the moment, I’m taking a break from my studies to focus on my art. Recently, my days have been filled with drawing and stippling. Next year, I’ll work toward completing a degree in painting at Ulsan University, and after that, I hope to do a post-graduate degree in fine art. Why do you go by the name Mistletoe? It’s something I decided while doing my military service. I noticed how the mistletoe in the area thrived, even with the harsh arrival of winter, while other plants withered and died. I considered how life can be like that, too — heavy and unforgiving, yet somehow we still find a way forward. What do you do when you aren’t drawing? To relax, I like to read fantasy and science fiction comics, as well as play strategic games like Company of Heroes. I’m also really interested in historical dramas like Alatriste and Schindler’s List. 오랫동안 그림을 그려오긴 했지만, 정말로 미술을 시작한 건 고등학교 2학년 때부터다. 수업시간, 특히 수학이랑 과학시간에도 그림을 그려서 선생님들을 당황시키곤 했다. 근데 그때도 역사 과목은 좋아해서 역사 시간에는 그림을 그리지 않았다. 지금도 여전히 세계 역사를 배우는 것에는 열정적이다. 미술로 전공을 정하게 된 특별한 동기가 있나? 고등학교 친구가 말했는데 “민희야, 너 진짜 그림 잘 그린다. 네가 만화를 그려야지” 그래서 그림을 그렸다. 근데 한국 사회에서 대부분 그렇듯이 안정성을 요구하는 직업을 선택해야 한다는 압박감이 있다. 나 또한 예외는 아니었고. 결국 대전에 있는 중부대학교의 애니메이션과에 진학했다. Has drawing always been a part of your life? I’ve been drawing for a long time, sure, but I really started teaching myself in the second year of high school. I’d draw cartoons during class, especially in math and science classes, at the dismay of my teachers. Even then I was fascinated by history and would take a break during the hours in which it was taught. I was and still am passionate about learning and understanding world history. What motivated you to pursue a degree in art? A high school friend said to me, “Minhee, your drawings are great. You should make cartoons.” So, that’s what I did. But, as is often the case in Korean society, there was the pressure of pursuing a career that offers stability and job security. I was no exception. I went on to study cartoon animation at Daejeon’s Jungboo University. 그 부분에 대해서 더 얘기해달라. 조금 숨막히는 분위기였다. 내가 생각하기에 몇몇 대학교들은 교수님들께서 대부분 짧은 시간에 한정된 수업만을 하신다. 또 그분들께서는 도전적인 것들을 환영하시지 않는 것 같다. 그렇게 2년을 다니고 나서 군대에 가기 위해 다시 집으로 내려왔다. 그 후, 학위를 끝내려고 돌아가려는 찰나에 그런 분위기에 스스로를 억지로 맞추려고 혼란스러워하는 나를 발견하게 되었다. 내 사고방식이 극적으로 바뀌었고 내 동기들처럼 하지는 못하겠다는 생각이 들었다. 학교에 있는 사람들은 자신의 작품에 대해서는 심각하게 고민하고 또 배우고 실력을 쌓기보다 노는 것에 더 집중하는 것처럼 보였다. 그런 삶과는 전혀 맞지 않다고 생각해서 다시 울산으로 돌아왔다. 작품에 대해서 더 얘기해줄 수 있는가? 말하고자 하는 것이 무엇인가? 내 개인적인 작품들은 전부가 시간과 경계를 넘어서 관련 지을 수 있는 어떠한 방식으로 역사를 해석하는 것이다. 동유럽 역사가 가장 영향을 많이 끼쳤다. 작품을 통해서 잘 알려지지 않은 러시아, 체코, 독일의 역사들을 보여주고 싶었다. 한국 사람들 대부분은 유럽 역사의 일반적인 부분만 알고 있는 경우가 많다. 초등학교에 다닐 때, 아트 슈피겔만의 코즈믹 작품들을 진짜 좋아했다. 슈피겔만은 작품에 개인적인 경험들을 많이 사용했고 ‘Maus’라는 제목의 장편 만화책을 출판하기 시작했다. 나는 그 책에 숨겨진 그만의 스타일과 생각들이 좋았다. 동물들의 삶을 통해서 홀로코스트 생존자인 슈피겔만 아버지의 인생을 보여주고 있다. 나치들은 고양이, 유대인들은 쥐, 폴란드인은 돼지로 풀어나가고 있다. 그의 작품은 한국사회의 어려움들, 간과되고 무시되어온 여러 가지 어두운 면들을 보도록 영감을 주었다. 나는 보통사람들이 이해할 수 있는 작품들을 그리고 싶다. 지금은 두 가지 시리즈의 일러스트 작품이 있는 것으로 알고 있다. 작품들에 대해서 더 자세히 얘기해준다면? “Klome의 왕자” 시리즈는 중세 시대를 배경으로 하는데 토끼들의 파벌로 인해 쿠데타가 일어나는 때의 장면을 그렸다. 이 작품은 쫓겨난 개구리 왕자가 도피생활을 하는, 그의 분투를 나타내고 있다. 그림을 그린 건1년전부터 인데 이 작품의 시리즈를 점묘법으로 그렸다. 다음으로 “New discipline Propaganda”는 막연히 세계 1,2차 대전을 배경으로 하고 있다. 군복무 기간 동안 작업을 시작했었다. 철원에서 복무하고 있을 때가 바로 비극적인 천안함 사건이 일어났을 바로 그 때다. 그 사건을 통해 많은 군인들이 겪은 분노와 슬픔과 불의를 함께 느꼈다. Can you tell us more about your work? What has informed it? My personal work is all about translating history in a way that is relatable beyond time and borders. Eastern European history has influenced me greatly. Through my work, I’d like to show something of the unknown histories of Russia, the Czech Republic and Germany. In Korea, most people are only exposed to a very general version of European history. When I was in elementary school, I really loved the comics of Art Spiegelman. Spiegelman used a lot of personal experiences in his work and went on to do a very long comic book titled Maus. I loved the style and the ideas behind it. It showed Spiegelman’s father’s experiences as a Holocaust survivor through the lives of animals. He depicted the Nazis as cats, the mice as Jews and the Poles as pigs. His work inspired me to show the hardships that exist in Korean society, the dark aspects of it that are often overlooked or ignored. I want to make art that the common man can relate to. At the moment you have two series of illustrations. Can you tell us more about them? 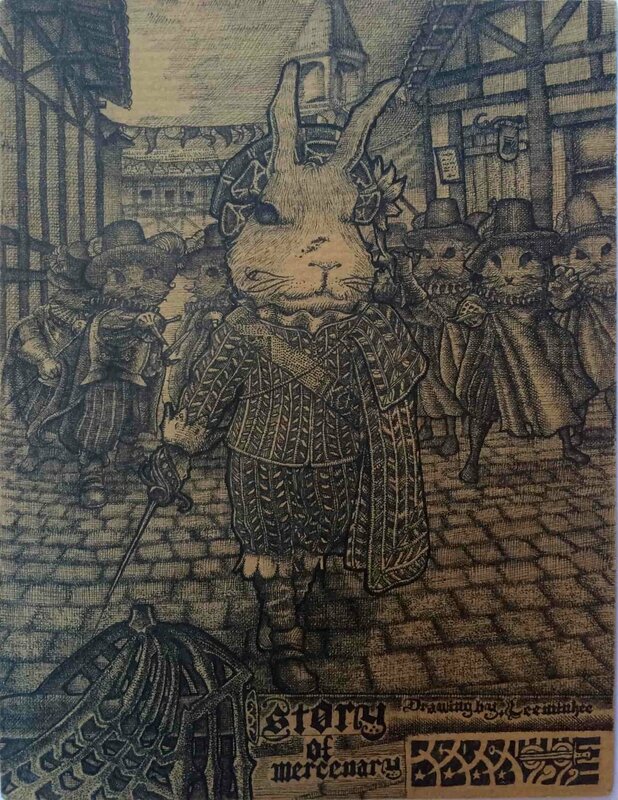 “The Prince of Klome” series is set in a fictional medieval land at the time of a coup orchestrated by a faction of rabbits. It shows the Frog Prince’s struggle after he is ousted and forced into hiding. I started stippling this series about one year ago. “New Discipline Propaganda” is loosely based on events of the First and Second World Wars. I started working on this during my military service. I was stationed in Cheorwon at the time of the tragic attack and sinking of the Cheonan ROK navy ship. That event made me identify with the fear, sadness, and sense of injustice that I’m sure many soldiers face in times of war. 작품에서 나타나는 개인적인 경험에 대해서 좀 더 얘기한다면? 이 작품의 부분에서, 개구리 왕자는 엄청나게 무거운 짐들이 실린 수레를 끌고 있다. 우리나라 고등학생들을 보면 학업이라는 무거운 짐을 이미 지고 있는데도 아르바이트를 한다. 굉장한 부담이다. 고등학교 때, 나는 학교에 가기 전, 일찍 일어나서 우유배달을 했다. 그림에서 다르게 표현한 유일한 한가지는 수레가 오토바이로 변한 것 밖에 없다. 다른 점은 “근거 없는 잔인함”이라는 이름을 가진 시장이다. 어렸을 적 부모님과 함께 울산 우정동에 있는 시장에 갔을 때, 한 꼬마 아이가 우유를 옆에 있는 가판대 주인에게 다 쏟아버린 것을 본 적이 있다. 그 주인은 무척 화가 났었고 그의 옷은 다 엉망이 되었다. 아이의 부모님은 무척이나 부끄러워하면서 계속해서 사죄를 했다. 그리고는 아이를 때리기 시작했다. 점묘법으로 그린 그 장면에서 사람을 동물로 대체시켰다. 그 그림에서 아이는 더 극단적이고 걸맞지 않은 체벌을 당했고 결국 가판대 주인이 아이를 죽이기까지 한다. 그 뒤에서 목격자였던 나처럼 개구리 왕자는 그걸 가만히 보고만 있는다. 작품이 무척이나 세세하다. 점묘법은 많은 시간과 노력을 요하는 작업이라는데 언제부터 점묘법으로 그림을 그리기 시작했나? 점묘법에 매료된 이유나 계기가 있는가? 고등학교 때 점묘법을 알게 되었고 그 후로는 이따금 점묘화를 그리곤 했다. 다른 방법으로 그림 그리는 것을 시도해 본적도 있다. 에칭, 그래픽 아트, 점토 모형, 그리고 아크릴까지. 항상 이런 방법으로만 그리는 것은 아니었다. 처음에는 연필로 스케치를 했었는데 다음에 점묘화로 넘어왔다. 대부분은 스케치하고 페인팅하는 게 더 간단한 작업이라고 말하지만 나는 이런 도전을 즐기고 점묘화를 그리는 것에 만족한다. Could you tell us about some personal experiences that can be seen in your work? In one piece, the Frog Prince pulls a wheelbarrow loaded with impossibly heavy barrels. Many Korean students take on part-time work in high school on top of their already crushing academic load, and this shows that particular burden. In high school, I was a milkman, and I’d get up incredibly early before school. The only thing that has changed since that scene in the picture is that the wagon has been replaced by a motorcycle. Another instance I can think of is the market place scene titled, “Groundless Cruelty.” When I was a young child, I remember visiting Ujeongdong Market in Ulsan with my parents. I saw another child spilling milk all over a stall owner. The man was irate and his clothes ruined. The child’s parents felt visible shame, apologized profusely, and proceeded to beat the child. In the scene I stippled, the people have been replaced by animals. The child receives a more drastic and unbefitting punishment, eventually being killed by the merchant. As I was the observer back then, so the Frog Prince is here. Your work is incredibly detailed. Stippling must be a very laborious task. When did you start this technique and why have you stuck with it? I discovered stippling in high school and have been doing it on and off ever since. I’ve experimented with other mediums, too. I’ve done etching, graphic art, clay modeling, and painting with acrylics and poster colours. The sound of etching drives me mad, though! I didn’t always draw in this style exclusively. At first, I did pencil sketches and then moved on to stippling. Many have suggested that painting would be simpler, but I relish the challenge and the satisfaction that comes with stippling. 캐릭터와 이야기 장면에 대한 책을 가지고 있다. 밑그림을 그리기 전에 3페이지에 걸쳐서 쓴다. 그리고 나서 HB와 2B 연필로 크래프트지에 밑그림을 스케치한다. B6정도 크기에 스케치북을 사용하는데 대략 아이패드 미니만한 사이즈다. 연필로 작업을 끝낸 후에는 0.003 or 0.005mm 의 아키바 펜을 이용해서 내가 할 수 있는 한 가장 많은 시간을 투자해 점을 찍는다. 하나의 작품을 완성하기 위해서는 보통 3일 이 걸리는 것 같다. 믿을진 모르겠지만, 점묘법으로 그림을 그릴 때 이정도 크기에서는 내 눈을 상하게 하진 않지만, 그림이 더 크거나 디지털화되면 아마 문제가 될 것이다. 이정도 크기의 작업은 진짜 괜찮은 편이다. 종종 불 하나만 키고 조용한 가운데 밤 늦게까지 작업을 한다. 늦게까지 작업할 때 들려오는 작은 소리들, 평온한 분위기들을 좋아한다. 언젠가는 작업하는 동안 바그너나 다른 클래식 음악들을 들으면서 작업할거다. 앞으로 어떤 예술을 하고 싶은가? 만화를 그려서 책을 내고 싶고 내 작품들을 세계에 전시하고 싶다. 미래에는 내가 그리는 인물들과 그들의 세계가 더 큰 캔버스에 그려지게 되겠지. 하지만 아마 디지털방식으로는 그리지 않을 거다. 지금처럼 계속해서 아날로그 방식으로 작업을 하고 싶다. 이 방법이 나를 더 인간적이게 만드는 것 같다. 내 작품은 순전히 내 자신의 즐거움을 위한 것들이다. 이걸로 돈을 벌고 싶지는 않다. 작품들과 이야기들을 다른 이들과 함께 공유하기만 한다면 나는 정말 행복할 것이다. How do you go about making your stipple art? I keep a book for character and scene stories. I usually write about three pages before I start drawing the image it’s based on. Then I start with a base sketch using HB and 2B pencils on Kraft paper. I use a B6 sized sketchbook, roughly the size of an iPad mini. After the pencil work, I stipple for as many hours as I can, using fine archival pens, weighted at 0.003 or 0.005mm. It usually takes me about three days to complete a single drawing. Believe it or not, stippling doesn’t really hurt my eyes at this scale, but if I were to go bigger or go digital, it might become a problem. Working at this scale really relaxes me. I often work deep into the night, using only one light, and sitting in silence. I like the small sounds, the tranquility, of the night. Sometimes, I’ll listen to Wagner or some other classical music while I work. What do you hope to achieve with your art in the future? I’d like to make comic books and exhibit my work abroad. I may expand my characters and their worlds to bigger canvases in the future, but I probably won’t go digital any time soon. I’d like to continue working in this analogue way. It makes me feel more human. My work is purely for my own personal joy at the moment. I don’t want to make money from it. As long as I can share my work and stories with others, I’ll be very happy.